Kindred: And the crowd yelled, "Encore!" And the crowd yelled, "Encore!" 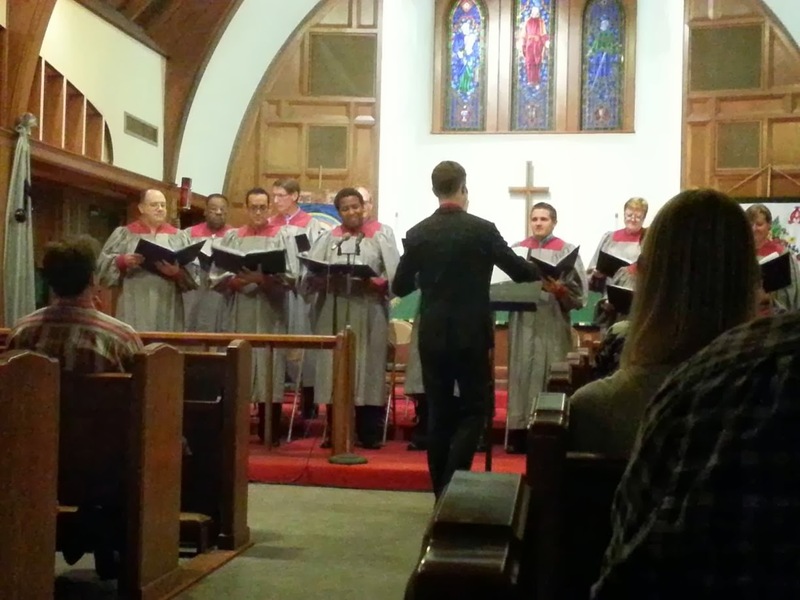 On Sunday, September 22, Grace Lutheran held our first-ever choir concert. With skill and ease music minister, Jonathan Craft, led the Grace choir in a special event called "Encore." During the 2 hour concert the crowd was treated to favorite songs that were presented throughout the last year. This was no small feat for Jonathan and the choir. A year ago, the choir had only four members, most of which did not read music. On Sunday night, the choir boasted 14 members singing 4 part harmony... acapella! Some of the evening standouts were the selection of Southern Gospel songs, Here I am Lord (featuring Wil Snodgrass), Eli Eli (with soloist Barbara Carroll), My God from Sister Act (with a special appearance by Ms. Tanya Hyde, herself! ), God Help the Outcasts (with a solo by Amanda Lavelle), Seasons of Love from Rent (featuring Charles Wilson and Nanette Griffin), and another song from Sister Act, I Will Follow Him (featuring Landon Duncan). There was another reason to celebrate. Jonathan has now officially been with Grace for 1 year. The skill and dedication of the choir is a true testament to all of the work he has put in. At the end of the concert, Jonathan gave a moving speech telling the story of when he got the job. He explained that he knew that he was not necessarily the most qualified candidate when Grace was looking for a music minister, but he felt in his heart that this is where he needed to be and this is where he could make the most difference. Lucky for us all, Grace agreed and brought him on. We also all cheered and gave much applause to the fact that James Graham generously donated a beautiful, new baby grand piano for the sanctuary. Jonathan put it best when he said you can definitely hear and feel the difference in the music with this lovely new instrument. "Encore" also served as a fundraiser. While admission was free, donations were accepted to benefit the future of the Grace music ministry. The next goal is to purchase a new organ. As of today, we raised (through pledges and donations) $6,726 at the concert. We are well on our way to a new organ, but we would still love your help! If you are interested in donating to the music program, please email office@gracelutheran-houston.org. As always, any contribution helps! As you can see, we had quite an evening on Sunday. The sanctuary was filled with harmonies, "Encore! "s, and of course, God's love. We definitely can't wait for the music event comes next at Grace. We know, whatever it is, it will astound you!